This interview was previously published in Sculpture, 23(9), pp. 26-7, November 2004; and in G. Harper & T. Moyer (Eds. ), (2008), Landscapes for Art: Contemporary Sculpture Parks, pp. 72-4. (International Sculpture Center Press: Hamilton, NJ, USA). Luc Delue art: Obelisk (left) and Triumphal Arch (right), (2003). 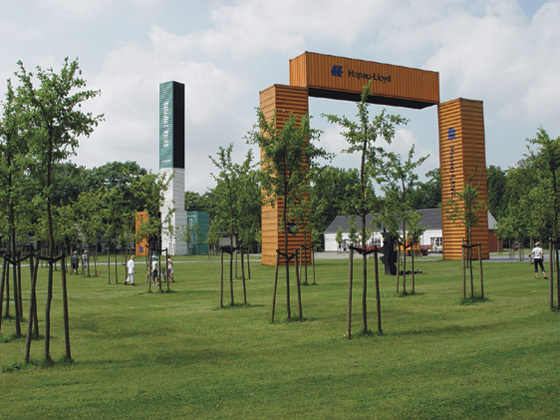 Shipping containers, installed at Middelheim Open Air Museum of Sculpture. Image courtesy Middelheim. Located on a lovely 62.5-acre site on the edge of Antwerp, the Middelheim Open Air Museum of Sculpture features some of the more important sculpture exhibitions in Belgium. It also acts as an important reference collection for modern sculpture from Rodin to the present. Middelheim features a 240-square-meter pavilion for exhibitions and over 250 permanent outdoor sculptures. For temporary exhibitions, artworks are shown inside the pavilion and outdoors, with a fluid connection between the two sites, and permanent works are often purchased from these shows. Middelheim’s beginnings date back to a large international exhibition organized in 1950 by a committee representing the City of Antwerp. This show consisted of 167 sculptures by 104 sculptors, including Rodin, Ossip Zadkine, Jean Arp, and Henry Moore. The sculpture biennials continued until 1989, with up to roughly 60 artists participating in each show. While in previous years Middelheim’s emphasis was on filling historical gaps in its collection, since 1993 its mission has shifted to a focus on contemporary art, “with the condition that it’s possible to show it in the open air.” Menno Meewis has been the director of the museum since 1992. R.J. Preece: What are the main challenges in running the Middelheim Open Air Museum of Sculpture? Menno Meewis: It’s a combination of different things. It’s very important to have an exhibition program, and we also have a museum for contemporary art. This means we have to purchase contemporary work. What’s very interesting for the museum is that we collect both modern and contemporary art. Most contemporary art museums start with art after World War II. We have more than 100 years of sculpture. A second important thing is to have more space. That’s what we did two years ago. But we don’t have enough money to acquire more property, so we’re working in different phases. Next year, we’ll make a new entrance and add new roads. R.J. Preece: Are there particularly unique challenges in running a sculpture park in Belgium, Flanders, or specifically Antwerp? Menno Meewis: I think it is the same as anywhere else in Belgium. Museums here are not very rich. We don’t have a lot of facilities— or possibilities. R.J. Preece: Why not? Belgians pay enough taxes. Menno Meewis: Yes, that’s so. But for contemporary art, it’s sometimes very difficult. Even in Brussels. R.J. Preece: What is Middelheim’s procedure for selecting artists for projects? Menno Meewis: We have a committee of advisors— with different people from other museums, from universities, art critics— and we meet twice a year. R.J. Preece: Is there a general vision for the contemporary programming? Menno Meewis: It’s always very difficult. It’s always a choice. Because our exhibitions are mostly connected with a purchase, we’re starting from our collection— what we’d like to purchase, what story we’d like to tell. That’s why we bought a Lawrence Weiner— we didn’t have a conceptual work in the collection. We didn’t have Minimalist art, so we bought a Carl Andre. R.J. Preece: So when you select an exhibition, one of the criteria is how it will fit in a 100-year history? Menno Meewis: If it’s an exhibition with an acquisition, yes. We buy carefully, because we always buy large work— and this has an immediate influence on the whole museum. It’s not so easy to take it away and put it in storage. R.J. Preece: Do you think that the Flemish art community— and its artistic developments— is more closely tied to the Netherlands in the north, as opposed to Wallonia (the French-speaking, southern Belgian region)? I’ve noticed, for example, that the artists and spaces seem more networked to the Netherlands. Menno Meewis: Yes, I think so. R.J. Preece: Is this just a practical, linguistic matter since you can speak directly to them? Menno Meewis: As a question of language, it’s true. But the differences between Flanders and the Netherlands are bigger than those between Flanders and Wallonia. Things are changing though. Before, in Wallonia, they didn’t do much for their artists or museums. Now we have the MAC (Musée des Arts Contemporains) in Charleroi. Also, the French-speaking community didn’t give a lot of money to its artists. But there are very interesting artists in Brussels [which is predominantly French-speaking] and Wallonia—that’s why we work with them also. R.J. Preece: Are there particular issues involved in designing, producing, and installing a public artwork at Middelheim Open Air Museum of Sculpture? Menno Meewis: It’s completely different working with open air. For instance, it’s very difficult to work with other open air museums to have traveling exhibitions. Other museums have white rooms, but for open air, the setting is always completely different— the landscape, the scale. We are in a very old park that dates back to the 14th century. It’s very difficult for us to bring in Land art, for example. R.J. Preece: What kinds of restoration issues do you face? Menno Meewis: We have a lot of bronze works that need maintenance and restoration. The works in stone are not always very easy to work with. It’s a problem. When we purchased works from the biennials, some were meant to stay only two or three months. Now they’ve been in the collection for 20 or 30 years. R.J. Preece: What are your future plans for the museum? Menno Meewis: We haven’t organized any exhibitions in 2004, because we want to invest in the infrastructure of a new site. Beginning in 2005, this site will be used as an outdoor exhibition space. But first, we’ll create a new entrance with a small building, install new roads, and site three or four monumental works. The roads and entrance will also be designed by artists.